*disclaimer* this is NOT a paid advertisement. This is me, talking about a product I tried because of a problem we were having in the house, and this is my opinion of how that product worked for us. We have a lot of it around here. Bad breath is caused by the breakdown of proteins in your mouth that, in turn, cause the release of sulfur gas. When you are awake the saliva in your mouth breaks down the gas but when you are asleep your mouth dries out, causing bad morning breath. Now lets talk about mouth breathers. Lots of people with Down syndrome are mouth breathers. Mouth breathing causes your mouth to dry out, leading to bad breath. In our house, two of our kids are mouth breathers and two are not. The two who are have the most horrid breath!!!! Sometimes when I walk into a room in the morning to wake up kids for school I have to hold my breath it is so bad in there! A couple weeks ago I was listening to Dr. Radio on satellite in my car. (I love Dr. Radio!) Anyway, they had this doctor on talking about the causes of bad breath and the use of probiotics for the mouth. Lots of us use Probiotics for GI reasons, but he was talking about using them in the mouth to eat the bacteria that cause the sulfur gas that causes the bad smell. Then the doctor started talking about a specific product called Therabreath that is sold right in our local drug store. I had never heard of it before. I stopped on my way home and picked up the toothpaste. The doctor's name is on the label so I was a bit skeptic, but Dr. Radio has credible people on so I decided to give it a try. It is a different consistency that what I usually see in toothpaste. Instead of thick and pasty, it is more like a semi-clear gel. It also disappears in your mouth almost instantly. It has a bit of a minty taste, but not as strong as regular toothpaste. It is not unpleasant and all four of the kids seem to like it well enough. The second product was the mouth wash.
Ok, I really didn't know if it was just overkill to use the mouth wash along with the toothpaste, but what the heck? I decided to try it for myself first, but Angela was all into wanting mouthwash like Mom so she used it as well. This is not as pleasant tasting as the toothpaste but Angela didn't seem to mind at all. 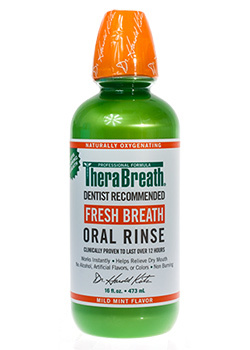 Also, you should gargle with this stuff to kill the bacteria sitting in the back of your throat and around your tonsils! The last thing I bought were the mouth wetting lozenges. Ok, these are *really* strong. I am not a fan of strong tasting things (I don't like spicy foods, or anything with a "kick") These are kind of a long the lines of Altoids in their flavor. 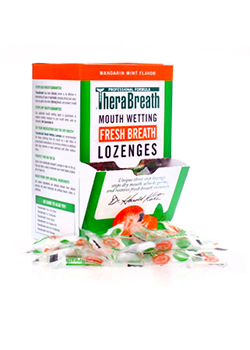 The purpose of these lozenges is to keep your mouth moist, plus add more of the probiotic. I have only had a couple of these and I really can not handle the strong flavor. Angela isn't able to eat hard candy so she hasn't had them, but Axel LOVED them!!! That first night before bed I brushed everyone's teeth with the toothpaste and Angela and I used the mouthwash. In the morning, much to my surprise, none of the bedrooms stunk from bad breath! In fact I could have a face-to-face conversation with one of the kids without feeling like I wanted to don a chemical suit! Amazing! I got everyone ready for school and we brushed again. When everyone came home from school I was pleased to find that their breath was still ok!! We have now been using these products for one full week and there has been a dramatic difference in the air quality in our house, and probably on certain buses and in certain classrooms! So, if you or your kids are having a problem with bad breath, I am giving my top recommendations to trying the Therabreath family of products! Give them a try then come back and let me know how they worked for you. I'm really curious! That's cool! I will keep in mind just in case . . .The biggest cause of bad breath in this house seems to be when one of the kids are coming down with a sinus infection . . . OY. That's my clarion call to break out the herbal decongestant which thankfully normally nips it in the bud before we have to break out the big guns. Pretty awesome. Another source of bad breath can be chronic tonsilitis, in which case the lozenges would be really the only effective treatment, but I think they'd work well. Very interesting....might have to check it out. Did it have an age recommendation on it? Owen has what Solito and I have termed "stink breath" in the morning and I'd love a way to get rid of it! 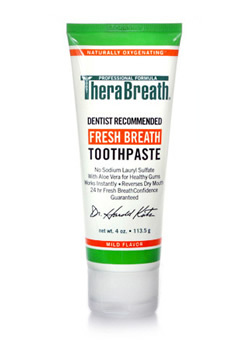 This is the only product that has helped w/ my daughters stinky morning breath. Even the product we got direct from the dentist didn't work like this one does. Hevel, they also have another product that is particularly helpful for those with tonsil stones and other "back of the mouth" stuff. Wonder if it would be okay for my dogs....obvious mouth breathers...heehee. End of the month Catch Up!